We offer various industrial threads for our clients. The thread rolling is basically a cold-forging process that forms the entire length of an external thread material. Threads are produced on the blanks of predetermined diameter by a rolling action under pressure and between two rotating cylindrical steel roll dies whose working faces are suitably threaded. 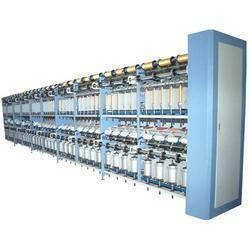 We have in store for our clients TFO Twister For Embroidery Thread (Combination Machine). Cam box Cam box with oil bath clicks pattern breaking offered helps uniform density and easily unwinding of Package. Spindle (Sec.) 110 m.m dia. aluminum hard anodized spindle disk with Ø 28m.m where dia Spindle and N.M.B brand 607 zz & 608 zz Bearing provided and the lowest spindle height is adopted to greatly reduce the balloon Size and low energy consumption and aluminum anodized container for long lasting low abrasive surface.